As a 501(C)(3) non-profit organization, Fishburne Military School works tirelessly to help make the cost of a Fishburne education affordable for families. We know that every family’s situation is different and we are eager to help you find solutions that work for your family. Please contact our Admissions Team with any additional questions or to schedule your family’s personal tour of Fishburne Military School. *These discounts are/may be prorated based upon other discounts or scholarships and the period of enrollment. Day students are offered reductions amounting to one-half of the amounts afforded to boarding students. *For additional information regarding Financial Aid, please contact FMS Admissions (admissions@fishburne.org; 800-946-7773). Fishburne Military School has been approved by the Virginia Department of Veterans Services, State Approving Agency to provide education and training to eligible students under Chapter 35 of Title 38, U.S. Code (Survivors and Dependents Educational Assistance Program pamphlet). Please contact the Business Office for details at (540) 946-7700 ext 102. Several scholarships of amounts up to $2,000.00 (based upon level of talent) are offered to students who are able to contribute musically to the Fishburne Military School marching band. For new students, an interview on the FMS campus is required. The student should bring his instrument and be prepared to play for the FMs bandmaster or his designated agent. The decision of the Bandmaster will be final. The recipient of a Band Scholarship must participate in band for the entire year. The scholarship is applied to the last payment due the school, based on the payment plan selected. Fishburne is constantly in search of young men with leadership potential. If you or your son has what it takes to be a leader in our Corps of Cadets but a premier military program's tuition seems beyond your your family's ability, WE WANT TO SPEAK TO YOU. *New students pay an additional $2,000 for uniforms. The uniform fee is due prior to matriculation and is included in the dollar amounts listed below. returning students will pay only for replacement items. *some advanced academic courses will require additional tools and texts. Parents will be notified in advance if their son is enrolled in such a class. 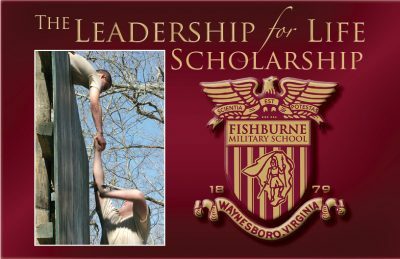 Fishburne Military School accepts multiple forms of cash payments for tuition and associated fees. This includes personal checks, cashier’s checks, money order or wire transfer. For the convenience of our parents, Fishburne also accepts most major credit cards. A 2% convenience fee will be added to all tuition payments made by credit card. Fishburne does not accept stocks, bonds, real estate transfers, barter, trade or any other form of non-cash payment or payment-in-kind for tuition and fees. Parents who have questions about paying tuition and fees should contact the finanace office at (540) 946-7700 ext 102. Under this plan, the patron pays the entire annual fee prior to matriculation, in return for which a discount of $1,000 is received ($500 for day students and not applicable for international students). These discounts may be prorated based upon other scholarships or discounts. *Parents are required to provide adequate proof of health/hospitalization insurance or purchase insurance from the school. Under the two-payment plan, the first payment is due prior to registration and the second is paid on or before 11 January. Under the monthly payment plan, the annual fee is paid with an initial payment and eight monthly installments. There is no finance charge for this payment plan; however, a $600 annual fee, which is due in advance, is added to offset administrative costs. In the event that the account becomes 30 days past due, the student will be subject to suspension from the school until such time as the account is current. Students whose parents reside outside the United States or its territories must use the single Payment Plan. International students must pay a $2,000 I-20 Deposit.There is no single payment discount for foreign cadets. Deposit is due prior to school issuing I-20. Fishburne Military School also offers tuition discounts to families of Veterans. Partial discounts of $2500.00 per year are also offered directly by Fishburne to sons of active duty military service personnel, including all of the armed services, the National Guard, and all Armed Forces Reserve Units; sons of veterans who have retired from any of the Armed Forces, National Guard, or Armed Forces Reserve Units after twenty years (or more) of active military service. If you or a Veteran you know needs assistance in providing for their sons’ education, please contact the Admissions Office for details at (800) 946-7773. We humbly thank you all for your service and sacrifice. Fishburne Military School has been approved by the Virginia Department of Veterans Services, State Approving Agency to provide education and training to eligible students under Chapter 35 of Title 38, U.S. Code (Veteran’s Administration Dependents’ Educational Assistance Program). Please contact the Business Office for details at (540) 946-7700 ext 102. Fishburne is constantly in search of young men with leadership potential. If you or your son has what it takes to be a leader in our Corps of Cadets but tuition seems beyond your your family’s ability, WE WANT TO SPEAK TO YOU. The Fishburne-Hudgins Educational Foundation is a 501(c)(3) non-profit organization dedicated to its mission of: providing young men with a sound academic foundation, a healthy mental and physical environment, and leadership training for a better understanding of the obligations of honor, citizenship and self-discipline. It is the parent organization of Fishburne Military School, the oldest and smallest of all military schools for boys in Virginia. The Leadership for Life Scholarship program is intended to prepare students for post-graduate studies at the college and university level, hopefully via ROTC scholarships or acceptance to one of the five service academies. The Leadership for Life scholarship is designed to provide financial assistance to students who desire to pursue this objective in a military school atmosphere and have demonstrated superior academic excellence along with an aptitude for community service.